Today, at the Brooklyn Nets practice facility, next year's college stars and likely a few 2019 NBA lottery picks took the court for practice, prior to tomorrow's Jordan Brand High School All-Star Game. 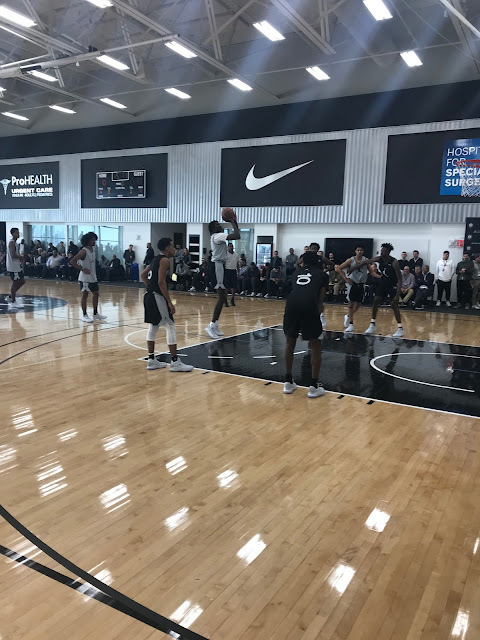 In front of a slew of NBA executives, scouts and media, a few of the participants stood out in a relatively competitive scrimmage. Most players showed flashes of their potential, but a few players stood out to me. Duke Commit and Social Media phenomenon, Zion Williamson, did not participate due to a wrist injury suffered at the McDonald's All-American Game. Tre Jones (Duke) looked a lot like his brother out there with adept drives to the basket and mature decision-making. Emmitt Williams (LSU) was perhaps the most energetic and definitely the most talkative on the court, as well as on the bench. But, his energy between the lines was infectious and he made plays on the interior, playing bigger than his 6'6 frame. Cole Swider (Villanova) was impressive inside and out, showing a nice shooting touch as well as toughness on the interior. Andrew Nembhard (Florida) may have been the most impressive guard today, showing quickness, strength and athleticism in drives to the basket, to go with a nice shooting stroke. Bol Bol shoots a free throw during today's Jordan Brand scrimmage. Bol Bol (Oregon) exhibited soft hands and a soft touch for a guy standing at 7'2. He was also an inside force on both ends of the ball.